You realise the move towards affordable natural skincare is really gaining momentum when one of the big guns of beauty launches a range to specifically meet that trend. 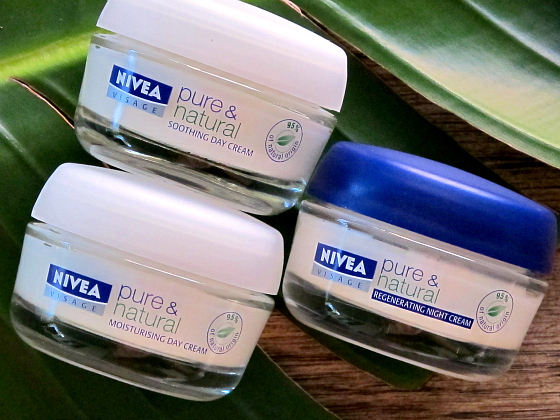 NIVEA, I’m looking specifically at you – and my new favourite affordable, natural beauty range, Pure & Natural. As you know, I was already a huge fan of NIVEA before I started working with them but this latest move? It’s got me even more excited. 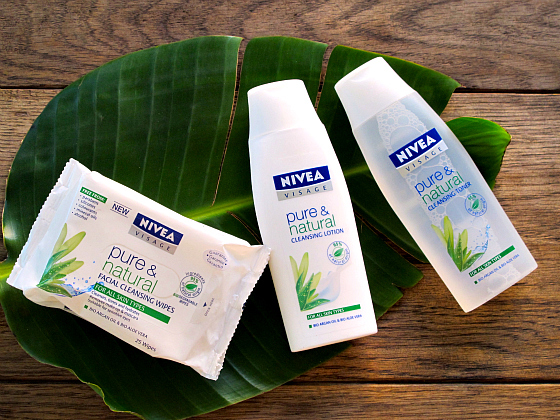 The NIVEA Pure & Natural range has been eight years in the making and has huge success globally. NIVEA first launched the Pure & Natural range in Australia last year with a body lotion, hand cream and two lip balms but it’s the skincare range launched this month that will enable you to also make a more natural, yet affordable decision, as to what you put on your face. What really impresses me is that NIVEA is being totally upfront with how natural this product range actually is. In fact, you’ll find it stamped on the jar, bottle or tube of each product. 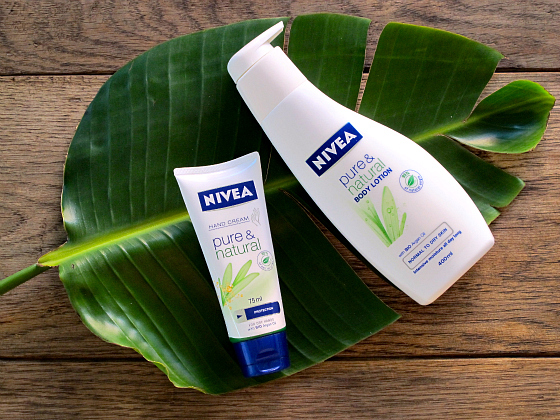 Each product (except for the two lip balms) in the NIVEA Pure & Natural range contains at least 95% ingredients from natural origin. They are free from parabens, silicones, artificial colourants and mineral oils. The active ingredients, such as Argan Oil, Aloe Vera and Chamomile, have been organically grown and are certified. Wondering what that 5% of other ingredients contains? A small amount of fragrance and preservatives, which are needed to maintain the shelf life of the product and make the organic ingredients still effective longer than a week. You see, it’s all too easy for the word “natural” to be added to a skincare product. It’s easy for us – the consumer – to be duped into buying something we think will be good for us but doesn’t stack up in the fine print. We also need to know that the skincare still works. That it will still deliver results. For me, those results take the shape of hydrated and fresh skin. Yes, I’m a hard taskmaster! I’m here to tell you that NIVEA Pure & Natural has delivered. The key ingredient in each of the products in this range is organic Argan Oil – something we may in recent years associate more with hair care – but it is something that has been used in skincare for centuries. It is a natural source of vitamin E and provides intense moisturisation, which works to leave skin looking smooth all day. I’ve been using key products in the Pure & Natural range for the past four weeks and will continue to incorporate them into my skincare routine – you know I love a sneaky supermarket beauty purchase so that won’t be a problem at all. The face range includes two day creams, one night cream, a cleansing lotion, a cleansing toner and wipes. Let’s talk about those wipes first, shall we? There is always a packet of wipes in my beauty cabinet and on my bedside table (for lazy-girl beauty bedtime rituals 😉 ) and the NIVEA Pure & Natural Facial Cleansing Wipes (rrp $7.50) are now my favourite. They’re in no way drying, effective in removing makeup, the fragrance is just right and they do not irritate my eyes at all. 1. Morning cleanse using NIVEA Pure & Natural Cleansing Lotion (rrp $9.97). This is perfect for my mature/sensitive skin. It’s gentle and soothing thanks to organic Aloe Vera as well as the Argan Oil. I use it with my Clarisonic electric face brush but it still cleanses beautifully without. 2. Tone with NIVEA Pure & Natural Cleansing Toner (rrp $9.97). Now, I don’t use a toner every day or night. Just when I think my skin needs and extra boost. This one is super gentle on my skin. 3. Sunscreen. This range doesn’t include a sunscreen so I add one at this step. This would be the only downside to the range for me but adding sunscreen ingredients such as UV filters would not keep the ingredients at 95% natural as these filters are not natural. 4. Moisturise with NIVEA Pure & Natural Soothing Day Cream for Dry & Sensitive Skin (rrp $12.99). This is the perfect day cream for me – it includes organic Chamomile to balance, soothe and reduce any redness. You might be more suited to the Normal & Combination Skin option, which harnesses the refreshing and hydrating properties of Organic Aloe Vera. 5. Moisturise body with NIVEA Pure & Natural Body Lotion (rrp $7.99). Oh, I just love this and my legs are pretty happy with the attention they’ve been getting from the Argan Oil. 6. Moisturise hands with NIVEA Pure & Natural Hand Cream (rrp $4.37). This is an essential on my desk for re-application during the day. It’s beautifully hydrating but not greasy. 7. Moisturise at night with the NIVEA Pure & Natural Regenerating Night Cream (rrp $12.99). I ask a lot of my night creams. I need them to work like mad while I’m sleeping so I wake up and look younger than the night before. Kidding. Well, sort of. I do love it though when a night cream works to hydrate and smooth the skin and give you a head start on the day ahead. And this one does all that. NIVEA does not test on animals. Almost 100% of its packaging materials are recyclable. Energy consumption at its production facility is down by 32% (2005-2011). What’s important to you? Do you favour skincare that offers more natural ingredients? For all the latest from NIVEA Australia, follow on Facebook, Pinterest, and Twitter. Its an an awesome brand and It never made me to go for some thing else like a particular beauty soap for some particular season. It works in every season. I heard about these wipes a few weeks ago and have been trying to pick up a pack for about a month now. I WILL find them. Good luck – Kathryn below got some yesterday! I prefer natural products for skincare, but the ones I love are mostly too expensive to use everyday. While I was in Priceline today I grabbed a pack of Nivea wipes. So was excited to see you’ve recommended them in this post! It’s important to me that my skincare routine is *simple*. I often get confused by products and what they’re meant to do. If their purpose is too specific, I won’t buy them. Skincare ranges can be a nightmare to navigate but I’m interested in having a look at this range – as we are generally a Nivea-loving family. What a coincidence, Kathryn … hope they work for you. I have actually used the wipes this evening and they are good! I’m really pleased that my face feels smooth after using them. They’re not drying at all! No more mineral oil is a great move. That stuff is cheap and nasty and really does terrible things to your skin deep down. Funnily enough, it was an experience with nivea products about 20 years ago that lead me to researching beauty products and ingredients, and banning mineral oil from my body. Even some more expensive brands contain around 90% mineral oil (also listed as liquid paraffin or other things). You’d cry if you knew how cheap mineral oil was. I have other ingredients on my ‘do not buy’ list but mineral oil is one of the best things to start cutting out. There is a great app called the chemical maze where you can look up the safety of ingredients to learn more and help with decisions when buying. While I don’t know if I’d buy this line, I am happy to see Nivea take leadership of meaningful change in the industry and I hope that it’s the beginning of the end of greenwashing used to sell toxic products. It is a good change, thanks for your comments Jasmine. I know – it really means we have no excuse to keep up some kind of routine! I wonder when this range will make it’s way to South Africa? I will defs be trying it, i love the idea of natural products, but just haven’t found a range I actually like that much..
I’d say it would, Pippa … only just here after being hugely successful in Europe. Oh, thanks Chrissie for sharing your recommendation! Its an an awesome brand and It never made me to go for some thing else like a particularbeauty soap for some particular season. It works in every season. SOLD to the lady on the corner. Indeed it is! And affordable too. When I first read your question – do I favour more natural skin care products, I immediately thought no. This doesn’t really come into my buying equation. The main consideration (apart from cost, of course) is it has to work. And I like “real” promises. I am not expecting there is a cream that will make me look 21 again but if it actually does what it is supposed to, then I am happy. However after thinking about it, I have realised it is important to me where the product comes from. I like the idea of a product made by a company that is working hard to bring us products that use the best quality ingredients and best possible processing practices as well as minimising their impact. Its seems like Nivea is really trying to do that. Definitely a product has to work Kelly – otherwise waste of time and money – but yes, it’s also great to think of its production impact. What is important to me in a skincare range is no 1 I don’t react and I still don’t know what it is I react to,I am thinking it is alcohol ? but not too sure and No 2 and Like you I expect a fair bit from my creams or at least to feel hydrated and look fresh,as my mature skin is sensitive as well.I will try the night cream for sure because I don’t think I will keep on buying the Lancome night cream especially if this one does the job,huge price difference,the argan oil would make it great for dry skin,hand cream I am not a slave to brands as I use so much,though Grown is my fave,but I will try this one as well,I bought the Dr Lewins one last week for $10 from priceline for a huge 200ml pump pack …bargain! and the wipes I will give them a go.I am happy to report I got up the guts to buy the Yes to cucumbers wipes in a small trial pack and I am very pleased with them ,I didn’t react and they do a great Job,and Thankyou Nikki for telling me about them.I have always liked Nivea products as when my skin was really bad the Nivea soft was the only thing I could use ,so yes I will try this new range. So important Lisa. My skin is not as sensitive as yours but it still can flare up without warning. These products have been fine on it and have been using for over a month now. Well I like that your happy with the products,I prefer a real persons perspective over a company hype anyday,I will try the night cream and the wipes when they are out,I saw the handcream this morning in Priceline,but not the other products. Sorry they weren’t there Lisa … should be rolling out into stores this month so hopefully next time.